Utica's CoLa neighborhood is not modern, far from it, but it's not Utica's worst and holds both great potential and promise for redevelopment. Get to know our partners at Better Utica Downtown. A claim made in the Region's MV500 Effort (PDF) called the targeted hospital zone in Downtown Utica as: "...34 acres of a largely vacant, underutilized and functionally obsolete area." This is a false claim. The Columbia Lafayette Neighborhood (CoLa) supports 40+ Businesses and Contains Many Historic Buildings (video) or view a #NoHospitalDowntown's Flicker Photo Album. 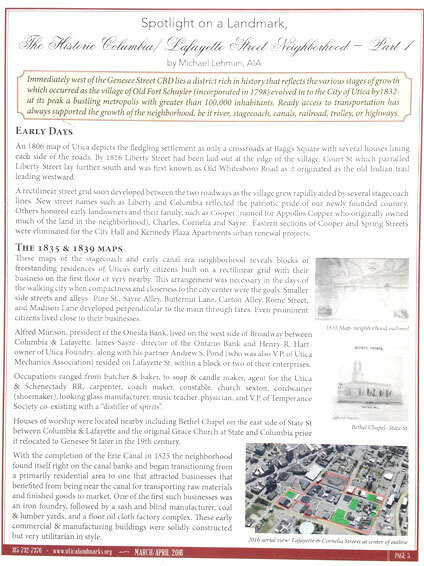 Those seeking to build a new hospital district, are now working on step one Bulldozing 1/4 of Downtown Utica's Small Central Business District Below you can read a detailed account of this neighborhood as documented by our Landmark's Society. Let's turn away the Government's Urban Renewal-style Concept For A Downtown Hospital & 34-acre Hospital District. Instead, let's restore some of the past! This as a new, walkable, and desirable place to live is promoted! Part II - May/June 2016: The Columbia-Lafayette Streets Neighborhood... Michael Lehman continues his review of Utica's "Historic Columbia-Lafayette Streets Neighborhood." Then finally, the Landmark Society offers their concluding thoughts below. Please act today, place a call(s) to your government representatives, and or sign our petition at a meeting listed below. Find us on Facebook as well.